An ideal combination of price and performance, the single-socket Dell™ Precision™ T3500 is designed to provide productivity and scalability gains well beyond the range of standard business desktop systems. The T3500 features the latest generation of Intel® Xeon™ architecture for fast, energy-efficient performance on a variety of single-socket workstation applications. The T3500 supports up to 24 GB* of system memory (including both DDR3 ECC and non-ECC memory), allowing for superior levels of application performance and data manipulation. Offering two PCIe x16 slots as well as ample power for its supported graphics cards, the Dell™ Precision™ T3500 works quickly to bring your design, animation, imaging or engineering projects to life. Enjoy peak performance from high-end graphics cards: The T3500 can be equipped with a range of workstation-class graphics options from ATI® and NVIDIA®. The T3500 offers tested or certified graphics drivers to help ensure superb performance with excellent reliability. Intel® Turbo Mode (designed to shift processor performance into a higher speed without consequences to system heat) and direct cache access help accelerate both single- and multi-threaded applications. Dell™ partners with leading ISVs to certify system compatibility, ensuring that the certified workstation applications you load onto the T3500 will run gracefully right out of the box. 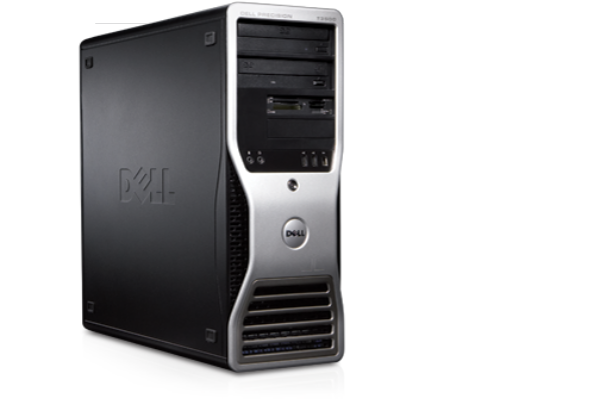 The Dell™ Precision™ T3500 offers a high level of energy efficiency and conforms to major worldwide energy standards, including ENERGY STAR® and EPEAT* registered configurations. The new generation of Intel® Xeon® technology affords the T3500 additional levels of energy efficiency, including the individual management of processor-core clock speeds (using the processor's internal power-control unit) and the ability to boost performance using Intel® TurboMode. All new Dell™ Precision™ tower workstations feature 85 percent efficient, wide-ranging power supplies for environmentally conscientious computing that doesn't sacrifice on performance. Professional, proactive and proven support services designed to address the technology challenges you face today, Dell ProSupport* starts with a service model designed for IT professionals like you. Additional Dell ProSupport™ options align to the way you use technology — rapidly responding to your needs, protecting your investment, your productivity and your sensitive data, and providing enhanced proactive support services to reduce the risk and complexity of managing your infrastructure. Specialized On-site Options allow you to augment your daily IT management or tap into specific technical expertize for critical projects when needed. On-site parts management to help minimize downtime by having parts at your fingertips. On-site personnel to augment your IT staff. On-site diagnosis for accelerated troubleshooting. Dell Managed Deployment Services are for customers, who need a complete, end-to-end deployment solution. Managed deployments are useful within complex logistical environments, which require a single point of contact. Dell provides streamlined standard installation services so that you can easily choose the specific package that quickly gets new systems into the workspace and old systems out. Dell offers comprehensive training services that include hardware and software training, as well as PC skills and professional development classes. Our flexible approach allows you to tailor classes to the needs and busy schedules of your employees with instructor-led classrooms or virtual courses, and even self-directed online options. Dell training can help improve system reliability, maximize productivity and reduce end-user requests and downtime.